America’s corporate CEOs feel entitled to pensions that pay out $86,000 monthly. To protect their entitlement, they’re attacking ours: Social Security. A new report neatly exposes the monumental hypocrisy of America’s most politically active corporate leaders. Deck the halls, this holiday season, with scenes of hunger. Struggling families all across America now have less food on their tables. Budget cuts that kicked into effect November 1 have lowered the nation’s average federal food stamp benefit to less than $1.40 per person per meal. Austerity American-style is squeezing elsewhere as well. Seventy percent of local agencies that service seniors have had to cut back on Meals on Wheels deliveries. The “sequestration” federal budget cuts that began this past March have also shut out 57,000 preschoolers from Head Start. More cuts are looming, as lawmakers on Capitol Hill near still another budget deliberation deadline, this one midway through December. The next federal program in the cross-hairs? Maybe the biggest of them all: Social Security. Average Americans, of course, don’t want Social Security cut. Over three-quarters of Americans, polling shows, oppose any Social Security cutbacks. If anything, average Americans have become even more committed to keeping Social Security whole — and for good reason. Social Security currently stands as America’s only retirement bedrock. Not too long ago, pensions also used to deliver real retirement security. But the nation’s biggest corporations have cut back on traditional pensions. 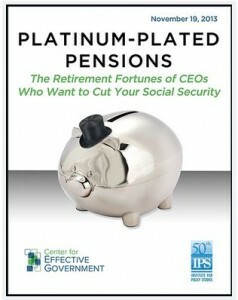 In 1980, 89 percent of Fortune 100 companies guaranteed workers a “defined benefit” at retirement. By last year, only 12 percent offered that level of security. Companies have replaced traditional pensions with 401(k)s, and many giant firms — like Walmart — don’t even offer a guaranteed match on employee 401(k) contributions. The predictable result? Among Americans between 50 and 64, the bottom 75 percent by wealth average just $26,395 in retirement assets. Overall, says Boston College’s Center for Retirement Research, the nation’s “retirement deficit” — the difference between what Americans have saved up for retirement and what they need to maintain their standard of living once retired — now totals $6.6 trillion. America ‘retirement deficit’ now totals $6.6 trillion. These corporate leaders — the nearly 200 CEOs who run the influential Business Roundtable and the over 135 chief execs who bankroll the two-year-old lobby group known as “Fix the Debt” — seldom ever mention “Social Security benefits” and “cuts” in the same sentence. They speak instead in euphemisms. The nation, they intone, cannot afford the current level of “entitlement” spending. In the name of “saving” Social Security for future generations, these CEOs are urging Congress to enact “reforms” that range from lowering the annual Social Security inflation adjustment to upping the Social Security retirement age to 70. These two changes, point out Sarah Anderson of the Institute for Policy Studies and Scott Klinger of the Center for Effective Government, would slice the average Social Security beneficiary’s lifetime benefits by about 20 percent. That prospect, Anderson and Klinger note in a new report released last week, does not terrify America’s CEOs in the least. These CEOs don’t need Social Security. They already have their retirement security. The CEOs of the Business Roundtable are holding an average $14.6 million in their corporate retirement accounts. In fact, these CEOs are sitting on what figures to be the biggest retirement bonanza in modern human history. The CEOs of the Business Roundtable are holding an average $14.6 million in their corporate retirement accounts, enough to pay out a $86,043 monthly benefit once they retire. Some CEOs will be pocketing even far larger pensions than that. David Cote, a key mover and shaker in both the Business Roundtable and Fix the Debt, is holding $134.5 million in his Honeywell retirement account. That tidy sum will gild Cote’s retirement at an incredible estimated rate of $795,134 a month! The typical American worker within 10 years of retirement, by contrast, now has only enough in saved-up personal retirement assets to generate a monthly retirement payout of just $71. If Social Security benefits shrink, notes the Center of Budget and Policy Priorities, millions of older Americans will slide into poverty. CEOs like David Cote may not need Social Security. But why are these CEOs driving so hard to cut Social Security for people who do? Several reasons may play here. The corporations these CEOs run don’t pay much in the way of corporate taxes today. They want to pay even less — and the less the federal government spends on Social Security and other “entitlements” like Medicare, the less pressure on lawmakers to seriously tax corporate income. CEOs also have a personal tax-time reason to want to see Social Security cut. Americans this year pay Social Security payroll tax on only the first $113,700 of paycheck income. This tax ceiling rises each year with inflation. CEOs don’t pay much in the way of corporate taxes today. They want to pay even less. But if we eliminated the ceiling entirely — and taxed CEO paychecks at the same rate as the paychecks of average workers — 95 percent of the expected Social Security budget shortfall over the next 75 years would disappear. America’s CEOs don’t particularly care for this approach to fixing Social Security’s fiscal future. They’d much rather just cut Social Security benefits. The American public clearly disagrees. Americans — by a 66-29 percent margin — last November told pollsters they favor eliminating the ceiling on income subject to Social Security tax. America’s CEOs have pumped tens of millions into lobbying efforts to quash ideas like this elimination of the Social Security tax ceiling, note Sarah Anderson and Scott Klinger in their new Platinum-Plated Pensions report. These CEOs are preaching “shared sacrifice” instead. We all must swallow hard, their pitch goes, and accept less from Social Security. Will these CEOs be able to get this pitch past Congress? Platinum-Plated Pensions will certainly complicate their effort. After all, as Anderson asked last week, how can CEOs who hold “retirement fortunes larger than the operating budgets of most mid-size American cities” ever expect anyone to take them seriously when they start lecturing the rest of us about “shared sacrifice”?